Sonia Angus: Assignment 1: Are You What You Wear/Buy/Sit On/Sleep In/Talk To? Assignment 1: Are You What You Wear/Buy/Sit On/Sleep In/Talk To? For our first assignment of this semester we were paired with someone in the lecture we hadn’t met, and asked to swap photos with them. The photos were to be either; un-posed photos of yourself from childhood to the present day or photos of your bedroom. 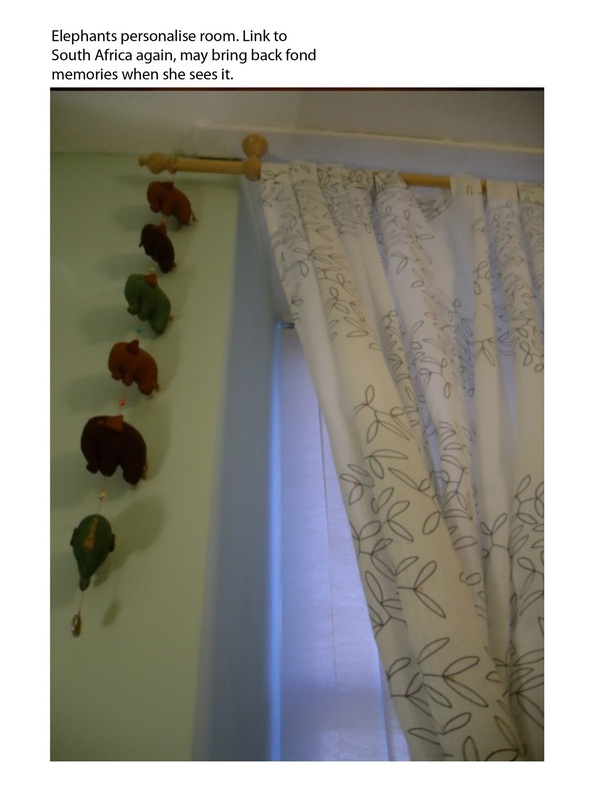 I sent a selection of un-posed photos to my partner, Laura Turok from Textile design, and she sent me images of her room. After we swapped photos we had to then analyse them. By applying some of the concepts we came across in ‘Snoop’ by Sam Gosling we were to analyse the photos and form a profile of our subject from our observations. 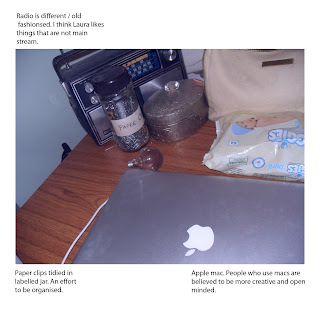 Below are the photos from Laura’s room which I found useful, I have also annotated these to show my thought process. I will then write a brief summary of my thoughts about Laura. My first impression of Laura was that she is someone who has her own style. 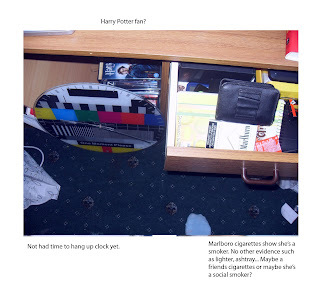 The items found in her room are not the type of things you could pick up in any shop or that you would find in a typical students room. 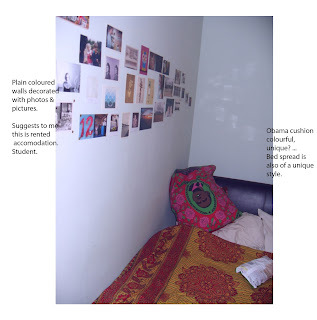 I noticed this in the fist picture I looked at, with the brightly coloured cushion of President Barrack Obama on her bed next to her red and yellow bed spread, which to me looked like it had an African style. I also saw this individuality in another picture where she has a retro radio on her desk. 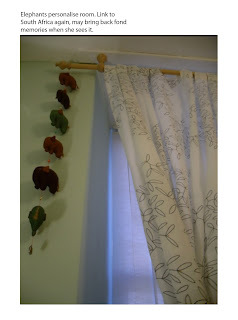 The African style seemed to continue as she had a carved wooden bowl on her dresser, little elephants hanging from her curtain rail and some images on her wall of African villages. 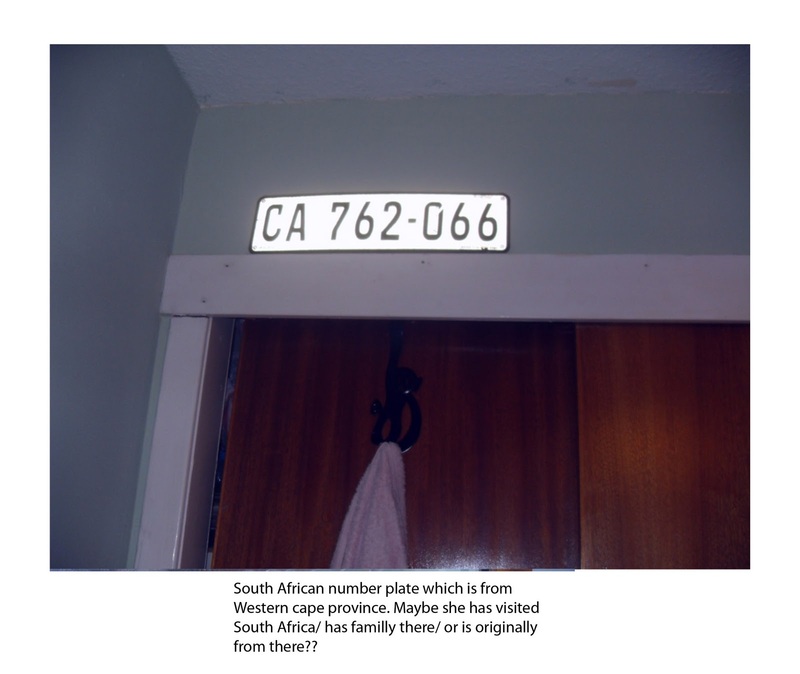 I also noticed a picture which I thought might have been her as a child, she had bright blonde hair and blue eyes, all of this led me to think Laura may be South African and lived there when she was little! She also had a car number plate hanging over her door I knew this plate wasn’t British. The plate began with the letters CA so I thought maybe it’s from California but noticed it was a different shape to the number plates in America. Due to my previous thoughts that she was South African I looked up South African number plates to find that this plate was from the Western Cape Province in South Africa. 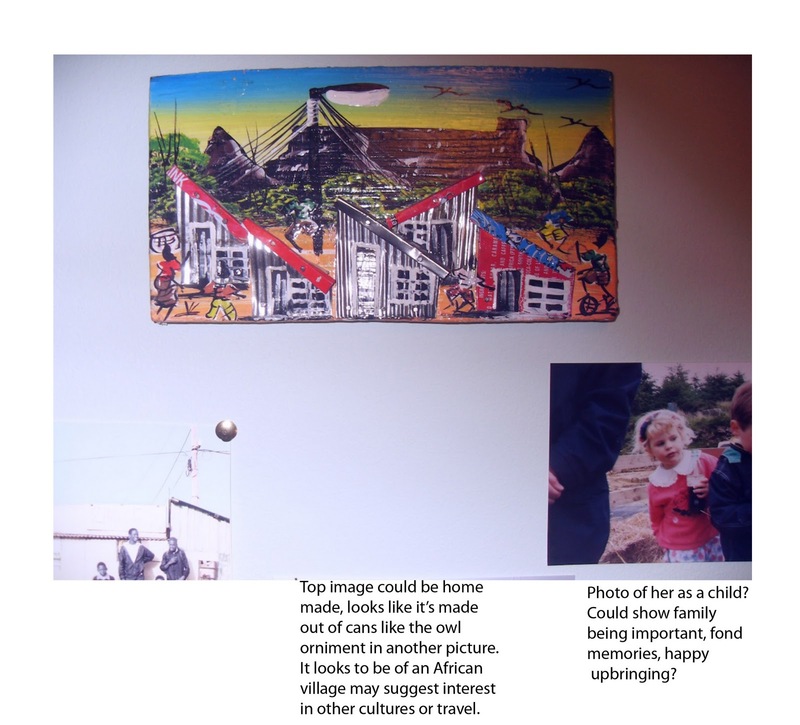 Laura’s room had plain walls which were decorated with photos and some colourful pictures. I therefore thought she must live in rented accommodation and was personalising the space. 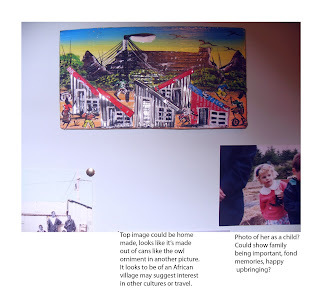 As the photos were not framed and hung on the wall, they were pinned up, suggested to me she was living there temporarily. 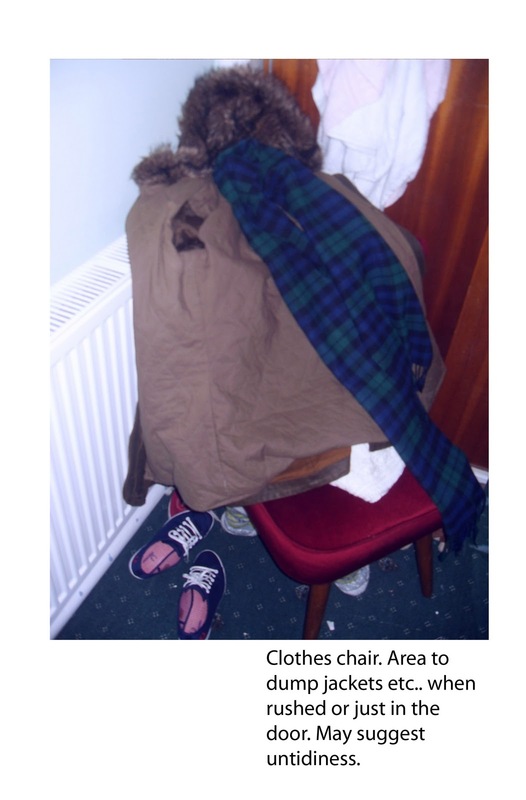 I felt by looking at the photos that I could relate to Laura as one of her photos was of a chair in her room which had clothes thrown on it. I have one of these in my room and feel it’s not because I’m untidy just busy! Her room in general was tidy and clean apart from “the clothes chair” and the bowl on her dresser which seems to collect all the odds and ends you don’t know where to put. (I also have one of these) On her desk was a jar of paperclips which was labelled and contained only paperclips. I came to the conclusion that she might be a bit like me in the sense that she wants to be tidy and organised but finds this not always manageable. She may not be a neat freak but she’s no slob! 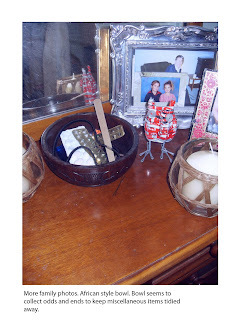 The photographs in her room were mainly of her childhood or with other members of her family this shows me that she is a family orientated person and has fond memories of her childhood. I thought that she may be a quiet person as there weren’t any photos of her with large groups of people or out clubbing. From Laura’s room I thought that she was a creative person. She had some ornaments which I thought she may have made herself. 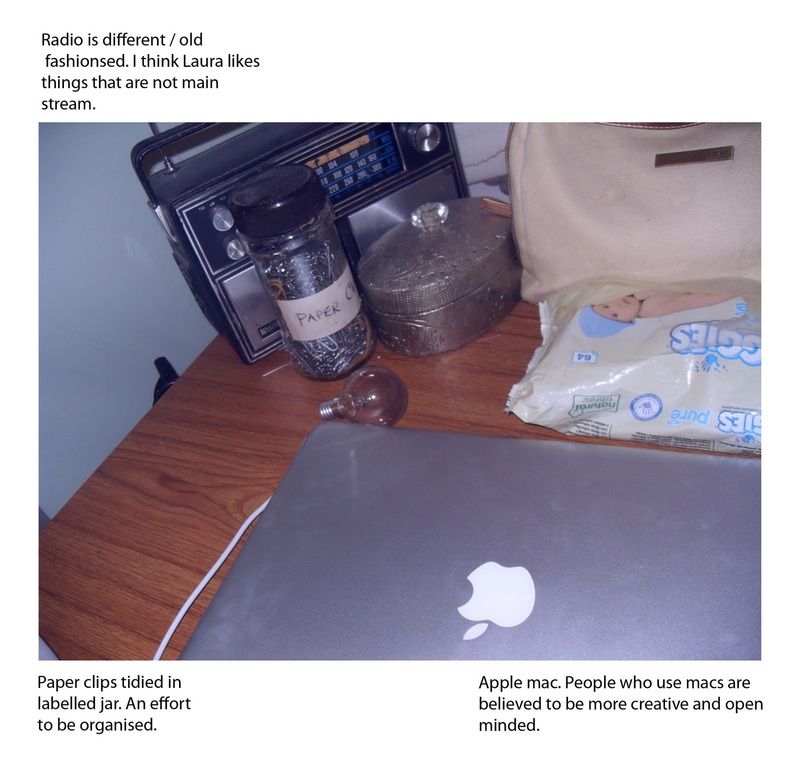 She also had a Mac book on her desk, people who use apple Macs are believed to be more creative than others. I was amazed at how accurate (apart from me being Mexican) she was especially as I thought she had a harder task as she didn’t have images of my room. She could see that I am a family orientated person and have been with my boyfriend for a long time. Although I’m not Mexican my gran is Italian so I do have some foreign connections which she was right about. Laura also asked if I had relatives that lived abroad which was correct as I have family in Italy. She also said that she thought I was from a middle class family which I would say I am. I would say I was quite casual in the way I dress and like to feel comfortable which she picked up on, she also noticed that I feel the need to dress up a bit more when I’m going out to pubs and clubs with friends. I didn’t realise how much I wear the bracelet my aunt gave me for my birthday a few years ago. Apparently it was featured a lot in my photos. So much so that Laura thought it must be very important or remind me of the person who gave it to me. This is partly true as it is probably my favourite piece of jewellery as it is comfortable and easy to wear but I wouldn’t say I am reminded by my aunt every time I put it on. I hope Laura thought my feedback about her was quite accurate although I did get a few things wrong. It turns out she’s not South African. I wasn’t too far off though, she is still connected to this country as she told me her step-dad who she is close to is South African and she is not long back from a holiday there at New Year. She said I was correct that she is someone who aspires to be organised and tidy but can’t always keep it up. I also thought she had an individual style which she said she is not conscious of but is drawn to things that are bit different, like the Obama cushion. The thing that I did get completely wrong was that I thought she was quiet. Her and her friend thought this was quite funny. When I explained the reasons why I came to this conclusion (I didn’t see any photos of her out clubbing) she said it was because she prefers to go out for drinks at pubs or at a friend’s house and not to go to a club. I was glad I to be paired with Laura she seems like an interesting person, we also swapped photos quickly and she was happy to meet up to discuss the assignment. I think overall we both did a good job. It was quite a tricky task especially trying not to jump to conclusions or rely on a stereotype, for example just because someone doesn’t show signs of clubbing and drinking doesn’t mean they are quiet. I didn’t mind being a research subject I quite liked hearing what someone else could pick up on that I might not have noticed about myself. It was also quite fun to put ‘Snoop’ to the test and see if I could actually create an accurate picture of someone by looking at their room. Some ethical considerations which are important when researching someone you don’t know would be; to ensure you have permission to use the information they give you and make sure the information they’ve given you stays private and confidential unless you have permission to do otherwise. For this task we swapped pictures so before I posted Laura’s photos on my blog I asked her permission to do so. Honesty is also key; you cannot ask for information under the pretence of using it for one thing then use it for something completely different. These are issues that would need to be taken into account when I carry out research in the future.